Robert Ferrara is a Director for The Center for Campus Fire Safety, and Director of Fire Safety for Montclair State University. He has 30 years experience as a firefighter in the Lyndhurst Fire Department, including serving as Chief. He is a licensed Fire Official and Fire Sub-Code Official. Jeffrey Issler is a graduate of Capella University, holding a PhD in Public Safety with a concentration in Emergency management. He is also a graduate of Montclair State University, holding a Master’s in Public Health. He is a certified Fire Inspector, Firefighter, and Emergency Medical Technician. Jeff is a member of The Center for Campus Fire Safety and is currently an emergency management specialist at Rutgers University. Understand the various components and staffing options available to campus fire prevention departments. Identify steps that can be taken during regular inspections to obtain compliance with the fire code. Identify reasons for developing key partnerships that are essential to the success of a campus fire prevention department. Identify required training and methods of conducting that training, given the limitations of available staffing. Identify various sources of funding that may be available, outside of his or her normal line-item budget. Identify means to ensure that all contracts awarded for fire and/or life safety work are advantageous to the respective institution. Identify Federal Laws and their impact on the campus fire prevention department. This chapter was written referencing the International Fire Code (IFC). Although other fire codes exist, such as the NFPA’s life safety code, the IFC was chosen as it is one of the more prevalent fire codes used domestically and internationally. Nevertheless, it is important that you perform your own research to ensure that the code requirements listed here apply to your jurisdiction and that further requirements do not apply as well. Fire prevention agencies on college or university campuses are as diverse as the populations they serve. While some take after traditional (e.g., municipal) fire prevention organizations, others employ limited staff who often have other responsibilities on the campus. Still others operate autonomously, while others are placed within differing work units. Regardless of their makeup, campus fire prevention officials are tasked with duties that are beyond that of a traditional, municipal fire prevention agency. Examples of such differences can be found in employee/resident training requirements, record keeping, life safety system installation and maintenance, and other associated responsibilities that a municipal fire prevention agency does not have, but that campus-based fire prevention programs are responsible to provide. Because of the great variety of fire prevention programs on college and university campuses and the great number of responsibilities these individuals or agencies have, the following subchapters have been submitted to allow for a more regulated and comprehensive approach to fire prevention. This chapter gives guidance to new fire prevention program administrators, helps existing fire prevention program administrators to excel, and adds key points for facilities managers to consider. Reporting or organizational management structures at educational institutions are as diverse as the populations they serve. 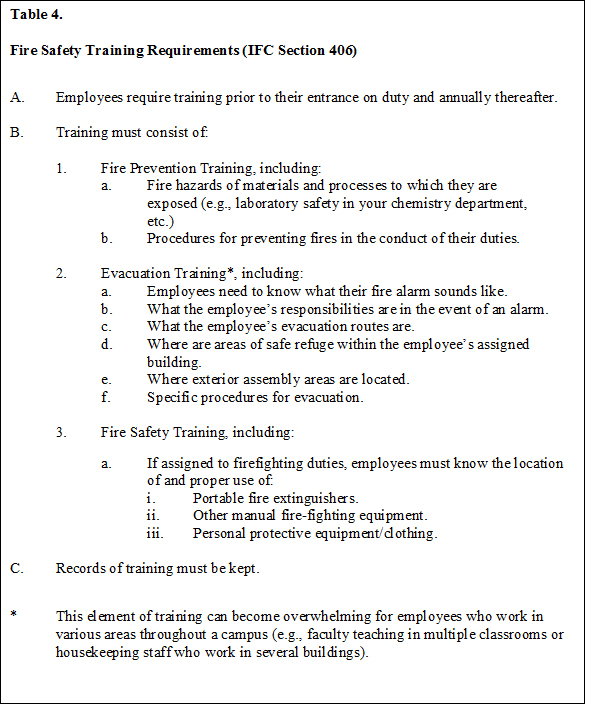 The following paragraphs discuss the staffing requirements of a campus-based fire prevention program. A successful fire prevention program must have adequate staffing for its campus. Though smaller schools may be able to operate a fully functional fire prevention program with a single individual who is also tasked with additional duties, larger schools require a larger department. Although this seems intuitive, fire prevention is often overlooked by campus administrators. At the very least, a campus fire prevention program needs to have a designated department head. Designating a single individual as the person in charge of fire prevention is important for a variety of reasons. First, it tasks the individual with code compliance and avoids the risk of complacency. Second, it allows the department head to be aware of life safety system impairments, ensuring that deficiencies are corrected in a timely manner and limiting the likelihood that multiple service calls are placed for the same condition. As an added benefit, the appointed individual can develop a working relationship with a given jurisdiction’s(s’) fire department(s). Using this relationship, the department head can relay information regarding system impairments to fire service personnel. A common approach to staffing a campus fire prevention office is to use a traditional fire prevention agency as a model. A traditional fire prevention agency (e.g., a municipal fire marshal’s office) consists of a fire official and fire inspectors. The fire official is the fire prevention agency’s department head; although this individual may be tasked with performing inspections from time to time, he or she is the administrative head of the organization. In New Jersey, the fire official is licensed to operate a Local Enforcement Agency (LEA) and acts as the authority having jurisdiction (AHJ); additionally, he or she has in-depth knowledge of what is required to run a fire prevention agency. The fire official is the individual ultimately responsible for issuing violations, penalties, and so on, in accordance with your jurisdiction’s administrative code. As their title suggests, fire inspectors perform regular inspections; in other states their responsibilities may also include plan review and inspections for new construction. Regardless of the specific subtleties of your jurisdiction’s (e.g., municipal, county, or state) fire prevention agencies, by mimicking how they operate—using a department head with licensed fire inspectors who report to a designated individual—campus fire prevention programs will reap the benefit of comprehensive inspection and education programs. In short, more staffing with adequate supervision equates to greater productivity. As noted in the introduction, campus fire prevention agencies have more responsibilities than a traditional municipal fire prevention agency. Because of the many requirements that must be fulfilled in terms of inspection, training, and other initiatives unique to each campus, placing stock in human capital is of the utmost importance. Small schools consisting of a handful of buildings may be able to get away with using a single individual for fire prevention programs, but medium and large schools require comprehensive programs consisting of multiple individuals. 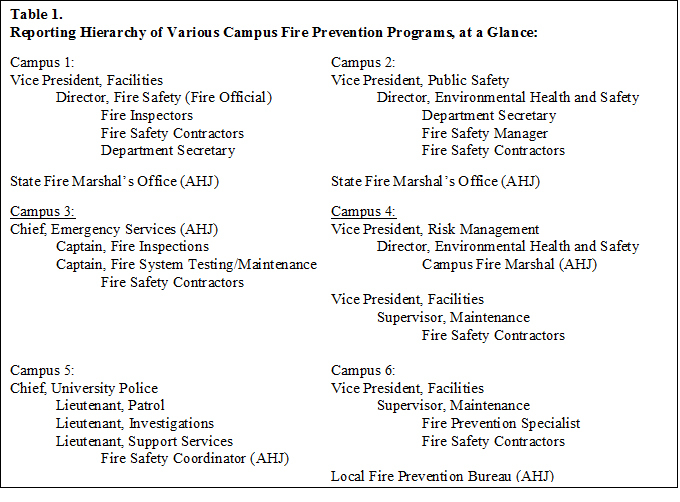 Table 1 shows configurations of various campus-based fire prevention organizations. Note that there is no standard hierarchy, and the campuses depicted here do not encompass the total number of conceivable variations in reporting structures. For the intent of this chapter, the authority having jurisdiction (AHJ) refers to the state, county, local, or campus-based fire prevention bureau (or fire marshal’s office) having legal enforcement powers under the administrative code of the state. AHJs provide the legal muscle and consequential enforcement powers behind fire prevention. However, all campuses operate differently. Some campus fire prevention departments rely on outside AHJs to conduct annual, semiannual, and quarterly inspections. Others do their enforcement in-house, with no other regulatory agency having primary oversight on their campus. There are benefits and drawbacks to each approach. Using an external enforcement agency allows the campus fire prevention office to be the “good guys/gals,” giving the image to the campus community that they are there to prevent their coworkers from getting into trouble and/or fined, and ultimately to keep them safe. This approach also allows the campus fire prevention agency to avoid any actual or perceived conflict of interest. Further, it allows for the correction of violations that the campus’s administration may not want to address, especially in cases when abating a violation may incur a large cost to the institution. Conversely, this approach can lead to difficulties if a representative of an enforcement entity does not fully understand the fire code. This can cause an influx of violations that may or may not be warranted. Having a good enforcement agency representative who understands the unique culture of a college campus can be extremely beneficial. Employing individuals who understand the fire code—and can form a cogent argument if an unwarranted violation is issued—is essential if the AHJ does not fully grasp the code, its requirements, or its intent. On the other hand, self-enforcement allows a campus to maintain its autonomy. Larger campuses can benefit from self-enforcement in that it prevents the duplication of efforts and in some states avoids the payment of life-hazard fees. On the other hand, self-enforcement can be troublesome if the campus fire prevention agency lacks adequate personnel and administrative support. Further, there may be an actual or perceived conflict of interest if the self-enforcing campus fire prevention agency is located in certain facilities departments, for example, a campus fire prevention agency located under the campus’s maintenance department. Facilities management’s role in enforcement. It is possible for a facilities manager to act as the AHJ. This would require the facilities manager to have extensive experience in fire prevention and to maintain certification at an administrative level (e.g., fire official), as listed above. It would also require a memorandum of understanding with either the state fire marshal’s office or a local AHJ, depending on state law. Even then, although the campus-based AHJ may have primary jurisdiction, state or local enforcement agencies may have concurrent jurisdiction, again depending on state law. Insurance companies’ role in enforcement. Insurance companies may require their insured property holders to comply with certain regulations that may be more restrictive than the fire code. In almost all cases, when an insurance company conducts an onsite inspection, their representative(s) will make note of violations and request that they be abated. Whether these inspections are legally binding or not is an issue that needs to be addressed with each campus’s risk management department or the department that handles the campus’s insurance policy. In some cases, following the insurance company’s recommendations may lower premiums; in other cases it will not. As the term “AHJ” generally denotes an agency or bureau involved in regulatory affairs, an insurance company would not be considered an AHJ. But failing to comply with the company’s requests could result in increased premiums, lack of coverage if an accident could have been avoided or mitigated by those requests, or cancellation of your school’s insurance policy. Although having a “one stop shop” for the installation, maintenance, and testing of fire alarms, sprinkler systems, fire extinguishers, and hood systems may be desirable for some agencies, others prefer to use various contractors. If you represent a public institution or a private institution with certain procurement procedures, you may periodically need to go out to bid for these contracts—a topic that will be covered in more detail later in this chapter. Regardless of the number of contractors you supervise, most states regulate contractors through licensure. In New Jersey, the Contractor Certification Unit of the State Division of Fire Safety oversees the licensing of fire safety contractors (including individuals and businesses) in the installation, service, and maintenance of fire protection equipment. There are four classes of licensure: for sprinkler contractors, fire alarm contractors, fire extinguisher contractors, and kitchen/specialized suppression system contractors. A fire safety contractor can be licensed in one area or in all areas. Ensuring that the contractors you are using are licensed by your state, if required, is essential not only for the safety of your campus community but for ensuring compliance with established laws. Aside from simply being licensed by a state authority, many campuses feel that additional certification is important to maintain a minimum level of competency. The National Institute for Certification in Engineering Technologies (NICET) certification is one example. NICET offers certifications in fire protection areas such as fire alarm systems, inspection and testing of water-based systems, special hazards suppression systems, and water-based (formerly automatic sprinkler) system layout. These certifications allow a customer—in this case the campus fire prevention official—to know that standardized criterion have been met to ensure that the employee performing work on a life safety system is knowledgeable in his or her work area(s). Additionally, there are several levels of certification that can help determine a contractor’s aptitude. By mandating that contractors maintain a level of certification, one can separate specialized contractors from the rest. Although much time can be spent lauding the merits of such certifications, each campus should look at NICET’s website and see if requiring these certifications is right for them. The use of certification in bid specifications will be discussed later. Each institution will have its own unique procurement procedures. Learning how your college’s or university’s procurement services work may help you in gaining valuable contracts and avoiding unfavorable ones. Today, a business cannot help but award contracts to the lowest bidder. Though these contracts may often offer services that equal or exceed their more expensive counterparts, it is entirely possible that these services, based on a cut-rate contract, may be less than favorable. To ensure that the contracts you are awarded meet a certain level of proficiency, you can include requirements in your bid specifications that make a contract less problematic to your college or university. As discussed earlier, one such requirement is certification. Including requirements such as NICET certifications into your bid specification will help weed out contractors who may not value employee training. After a contract is awarded, knowing its specifics will be important in ensuring that your work is completed efficiently. For instance, if your contract states that fire alarm system repairs should be made when a deficiency is found, allowing contractors to delay work can create a greater expense for the college or university. If your contract states that any service calls placed after a set time would be considered emergency repairs and thus subject to a higher rate, it may be more economical to wait until next morning to place a service call if the problem is not urgent (e.g., a leaking sprinkler head). As discussed earlier, having the span of control for life safety systems under the auspice of the campus fire prevention agency can benefit the college or university in that repeated or unnecessary service calls can be avoided. Further, housing the service contracts under the campus fire prevention agency means that the agency representative(s) will be more familiar with them. This creates an atmosphere where there is greater accountability for the contractors and their associated work. Standardizing your fire suppression and detection systems is equally important, as discussed earlier. When writing bid specifications, it is important to ensure that the contractors who will be installing, testing, and maintaining your life safety systems are qualified to do so. Although most contractors can install a sprinkler system, some distributors will only trust the reputation of their product to contractors that meet certain qualifications. For systems manufactured by Victaulic, for example, these qualifications include certification standards a contractor must meet to perform the installation. The same holds true for fire alarm systems. Some companies do not require contractors to be certified for their products. Others ensure that contractors are certified to test, repair, and maintain their systems. All of your contractors should be proficient and certified to install your life safety systems. It is recommended to spell out standards and requirements in your bid specifications rather than simply requesting blanket bids for life safety contractors. 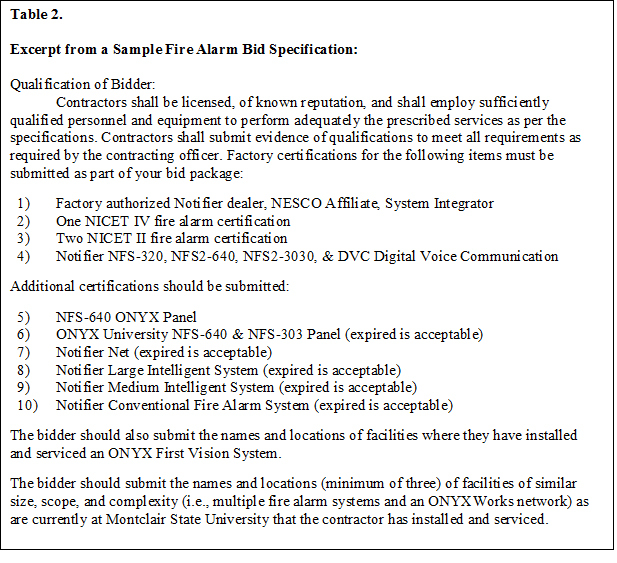 Table 2 shows part of the bid specifications for fire alarm contractors at one college in New Jersey. Note that the requirements are very detailed and are based on the college’s campus-wide standard. However, though almost all of their buildings use the same systems, some campuses do not have a streamlined approach. Thus, it is important that each campus fire prevention official knows the systems on his or her campus and ensures that each system is accounted for in the bid specifications. By accurately listing your requirements in a bid specification and keeping your expectations high, you can avoid entering into a contract that is disadvantageous to your college or university. 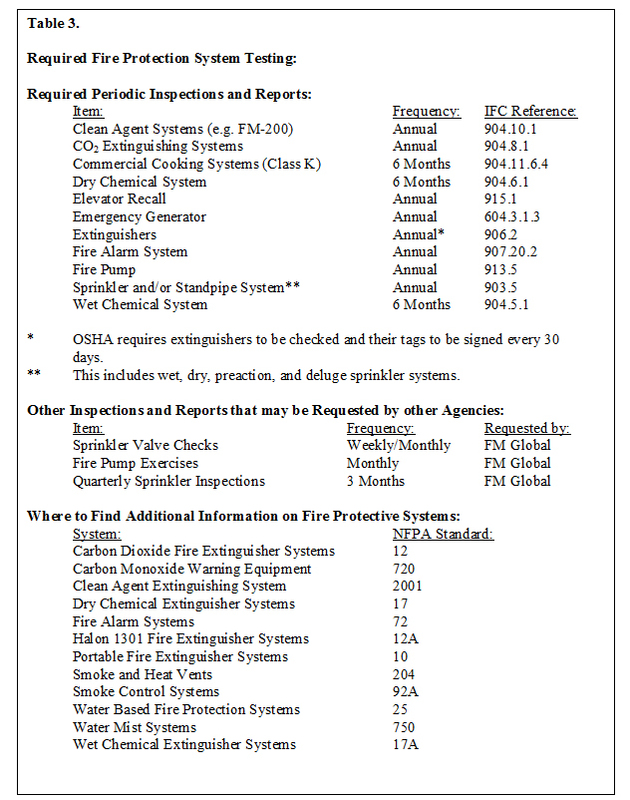 Although the bid specification listed in Table 2 is too long to show in its entirety, it illustrates that fire prevention agency representatives need to have specialized knowledge in fire detection and, by extension, suppression systems. At the end of the day, campus fire prevention personnel need to know as much about their systems as their contractors. Some of your on-campus partners may have standardized specifications for new construction or renovations. For example, the sinks or toilets that are installed in new or renovated buildings are often the same make and model. This allows your plumbing shop to keep spare parts readily available for repairs and to make repairs quickly, without having new items shipped to them. Fire suppression and detection systems should be treated the same way. Often colleges and universities have an array of system manufacturers who previously installed systems as retrofits or installed systems in new or renovated buildings with little or no standardization. In the interest of streamlining bid specifications, contracts, contractors, spare parts, labor costs, labor times, and nearly any aspect of installing, maintaining, and testing fire detection and suppression systems, adopting a campus wide standard is important. Depending on the location of your school, its climate, the proficiency of your contractors, their level of certification, and other factors, each campus needs to develop standardized systems for fire and life safety. Though it would be helpful to replace every single system with a newly adopted standard, it is not financially practical. There are several alternatives to replacing every device outright. One approach is to work with your facilities or construction departments to budget for the replacement of older systems on a year-by-year basis, while also ensuring that new construction or renovations receive the same systems. This approach spreads the cost of upgrading your systems over several years and ensures that the entire campus will eventually be on a standardized system. Another alternative is to replace systems with your new standard only when they are broken or past their service lives and when new construction or renovations are being planned. Although this may take longer, in the end you will benefit from having a streamlined system. There are many benefits to having a streamlined system. The availability of spare parts is of particular importance. When there are minor system impairments such as a defective smoke detector, having a supply of new detectors on hand allows a campus to fix the problem quickly. If there are major system impairments, having spare parts readily available will also help the contractors make quick repairs because they avoid the need to wait for parts delivery. An additional benefit of streamlining is that emergency responders can more easily become familiar with standardized systems, allowing them to act faster and giving them a consistent experience throughout the campus. The model fire code specifies that fire protective systems must be inspected in accordance with various National Fire Protection Association Standards, as well as other referenced standards. Other agencies, such as your insurance company, may require additional testing. Test records must be kept on file for one year. Table 3 lists many of the commonly required tests and associated reports. Additional information on this subject was compiled by John DeLaHunt as part of the Body of Knowledge. A link to his section is provided here. Fire detection systems. When testing fire alarms, especially when it becomes necessary to sound building alarms such as gongs or horn strobes, a fair amount of coordination may be required. First, the building occupants need to know about the testing ahead of time. Also, the testing needs to be conducted in a manner that does not impact the work processes of a work unit (e.g., ongoing classes). Efforts must be made to conduct these required annual tests in a manner and at a time that does not impact others. Periods of campus closure are often ideal times to conduct the tests, but these times can be inconvenient in that they are often holidays. So, the facilities manager needs to be flexible, allowing the campus fire prevention representative to oversee testing before or after work hours or on weekends. In this respect, planning is key. It is essential that the fire safety professional is capable of planning tests weeks if not months ahead of schedule. Moreover, the facilities manager needs to know about the potential impact these types of tests can have within the building. When testing occurs, building service features such as HVAC and elevators can be impacted. In buildings where the fire alarm is tied into an HVAC system, it may shut down during a test, and the same can happen with an elevator. To avoid unnecessary service calls or to have answers for the administration when these building functions are not operating, facilities management must be involved in coordinating these tests. Fire suppression systems. By and large, sprinkler testing can be accomplished with minimal interruption to ongoing work processes. A visual inspection of the sprinkler system elements may impact areas such as lecture halls, laboratories, or offices, but it is usually unobtrusive. When certain elements of the fire suppression system are tested, the fire alarm system may activate due to forgetfulness on the part of the technician. Because the facilities manager is sure to receive phone calls regarding such an activation, he or she should be notified of any ongoing work. In rare cases fire alarms activate because they are functioning improperly. When the alarms activate, they are sensing something in the air that they register as smoke, as they are only capable of determining if particulate matter is present. Regardless of the cause, unwanted activation of alarms can cause complacency within a campus population. After performing a survey of one college, it was noted that 80 percent of all fire alarms were caused by unattended cooking within resident halls. There are a number of steps that can be taken to avoid nuisance alarms. A reactive measure is to fine students for causing these alarms. A more proactive measure involves considerable expense for a campus. Systems are available that regulate the temperature of stove top units, preventing the range from going above the flammable limit of most common items that are cooked. Systems also exist that monitor the air coming from the exhaust port of microwaves. These systems automatically turn the microwave off when smoke is detected at an early stage, well below the point at which the fire alarm would activate. These systems offer a proactive but expensive alternative to college and university campuses. Facility managers need to determine if these or similar devices are worth the cost. Recent changes to the fire code may increase the number of nuisance alarms on your campus. IFC 907.2.9.3 requires that, in R-2 dormitories, smoke alarms in resident rooms must be interconnected and report to a central monitoring authority when activated. This major change means that battery operated, battery-operated and 110v single station detectors are no longer permitted in renovated or new construction. This change was brought about because with the older single station systems, the emergency services were not properly reported – in some cases, the resident(s) failed to extinguish the fire, failed to activate a pull station, or failed to contact 911. Because these detectors previously did not report to a central monitoring station, it is reasonable to assume that the total number of fire alarms on a given campus will rise with these new changes. The code, however, has considered your need to prevent the local fire department(s) from responding for each of these new alarms, as well as your need to prevent complacency among your residents. The model fire code states that smoke alarms in individual resident rooms should not initiate a general evacuation of the building (see IFC section 907.2.9.3 for further information). By activating only a local alarm, the resident is alerted that his or her actions/inactions caused an alarm and your campus police or public safety can respond to investigate, without the need for the fire department to respond. At the same time, however, such a system allow the other building occupants to remain inside. Of course, if the alarm was caused by smoke in a common area or due to the activation of the sprinkler system, a general evacuation would follow. Because of this reliance on the building fire alarm system for general evacuations, the code requires that smoke detectors in individual sleeping areas be interconnected to the fire alarm system, activating upon the sounding of the building’s fire alarm. Other measures, such as adopting new technology, can help alleviate the expected increase in nuisance alarms. For example, Notifier’s IntelliQuad detection system offers addressable detectors that have multiple sensors, including photoelectric, thermal, infrared, and carbon monoxide; in order for the detector to activate, it gathers inputs from its multiple sensors, in less than a second, and determines if a fire or nuisance condition is present. In other words, if the photoelectric component is activated without a rise in heat, increase in infrared radiation, or a rise in carbon monoxide (such as when a student overcooks, say, chicken), the alarm will not activate. If, however, multiple conditions are present (such as when the overcooked chicken catches fire), the alarm will activate. This system was successful in decreasing the number of nuisance alarms in an apartment style dormitory complex. During the 2013 spring semester, one of these buildings had six fire alarms due to unattended cooking, the remaining three buildings had an average of ten alarms for the same reason during the same time period; previous semesters followed a similar pattern with variances between the number of alarms in relation to each building. IntelliQuad detectors were installed in the first building as a trial program. The subsequent semesters saw a dramatic reduction of nuisance alarms from unattended cooking in the building in which these devices were installed. For instance, summer of 2013, the building had no alarms from unattended cooking and the other buildings averaged four alarms. Fall of 2013 saw three such alarms, where the other buildings averaged seven. Likewise, the spring semester of 2014 saw three fire alarms from unattended cooking, where the other buildings averaged around eight alarms. These detectors were adopted and installed throughout campus, which resulted in a reduction of fire alarms, due to unattended cooking, throughout the campus. Coupling new technologies with provisions of the model fire code results in fewer nuisance alarms on campus, which decreases the potential for complacency. Between 2013 and 2016, as fire alarm technology in our residence halls and fire alarm procedures were updated, Montclair State University saw roughly an 80% reduction in the number of fire calls (to residence halls) on their campus. Of course there are costs associated with installing these new technologies, but the benefits were well worth the costs in the eyes of our administration. These steps benefits not only the campus community, but also the fire departments responding to our campus – for all parties involved, these steps help to avoid the development of a “boy who cried wolf” mentality, thus limiting the potential for complacency. Ideally, avoiding an alarm in the first place would prevent the development of complacency; this, however, requires a degree of root analysis. Most of the causes of nuisance alarms can be lumped into a root single cause: ignorance. For instance, a student may not know that he/she needs to read the instructions on a bag of popcorn, rather than simply hitting the popcorn button; a housekeeper may not know that dusting near a smoke alarm can set it off; a film professor may not know that the smoke from his/her smoke machine, being used as part of a production, can set off an alarm. The ignorance of the general public, with regard to how life safety devices work, is something that can easily be addressed through training. The manner by which this training should occur will be discussed in the next section, along with other elements of fire safety training. An important element of a college fire prevention specialist’s job is conducting training sessions. There are a number of different groups requiring annual training, which can pose a daunting task for a lone fire prevention specialist. These trainings need not be in depth and generally have similar requirements (see Table 4). Prior to initiating training, it is important to develop a fire evacuation and fire safety plan for your campus (see Table 5), as this document will help steer your training. It will also give you a point of reference to which you can direct others when questions arise pertaining to your training. There are a number of ways in which faculty and staff training can be accomplished in a way that will not over burden the fire prevention department. For smaller campus work units, such as staff members who work at your library, face-to-face presentations may be acceptable. For larger departments, such as academic units that utilize full-time and part-time instructors, on-line training may be more acceptable. For these units, interactive on-line training is not required, simply having the employees read a policy and sign an acknowledgement stating that they have received the training is sufficient. Partnering with your information technology group can make determining who has signed off as having had the “training” and who has not can make your life much easier, as they will often be able to run information based on the acknowledgements that you have received. This can usually be accomplished through your college or university’s survey tool, with the collection of NetID’s or employee identification numbers (avoid the latter if social security numbers are used as employee identification numbers). Where online training is not an option but campus work units are too large to train face-to-face, “train-the-trainer” sessions are another acceptable alternative. By forming a cadre of designated “fire wardens,” and training them to train staff in their work units in fire prevention policies and procedures, you can ensure the training of a large number of employees with little effort. In this situation it is important to retain records of the initial “train-the-trainer” training and to teach your “fire wardens” to keep and send copies of records to your office. Training should be catered to the department or group for which the training is being conducted. For instance, by virtue of their occupations a welder is more likely to encounter fire hazards than an average lecturer. Thus, it is more important to provide specific training to a welder in elements such as hot work permitting than it is to provide comparable training to the average lecturer. Nevertheless, there are professors that may use welding as part of their processes, such as those in industrial arts, jewelry making, scene design, and other areas (we will return to hot work training shortly). So, it is important that each position at the institution is evaluated to determine the kind of training each faculty/staff member needs. You may find assistance for this from your college or university human resources department or environmental health and safety department. Partnering with your campus’s environmental health and safety office does not end with making determinations about job duties. Recent examples of campus-related laboratory accidents highlight the importance of departments (e.g., chemistry departments) receiving specialized laboratory safety training. Although the majority of this training falls outside of the scope of fire prevention and safety, the campus fire prevention official can take steps to include relevant fire safety instruction in existing laboratory safety training. 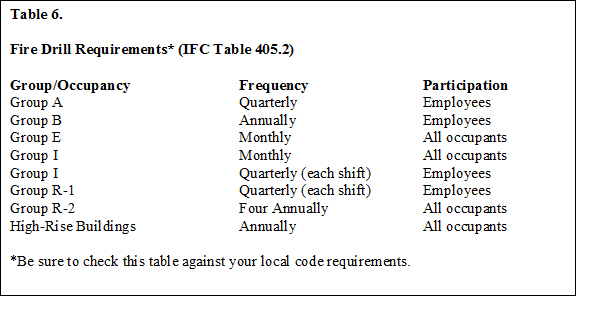 Employees who work in assembly areas (e.g., ushers working in an auditorium) need additional training in addition to that listed in Tables 4 and 5. Specifically, employees working in these areas must develop a seating plan, including an occupancy load and an occupancy load limit. The occupancy load limit is usually designated at the time a building receives its certificate of occupancy; this certificate is usually available through your campus planning department. Occupancy loads can be determined by your AHJ if a question or concern exists. IFC 408.2.1 states that deviations from the proposed occupancy load are permissible so long as the occupancy load limit is not surpassed and the aisles are free from obstructions, including individuals. Also, an audible announcement must be made within ten minutes of the start of a show, giving the location of exits to be used in the event of a fire or other emergency. In R-2 high-rises, an emergency guide stating the location, function, and use of fire protection equipment and appliances accessible to residents—including fire alarms, smoke alarms, and portable fire extinguishers—must be present. This guide should also include primary and secondary evacuation routes, and should be maintained and distributed to all residents. The simplest way to achieve this is through online systems. 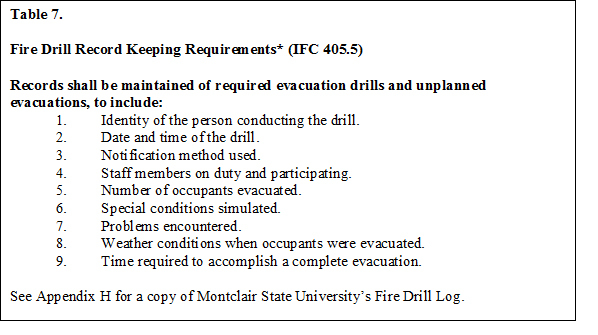 Montclair State University uses their online fire evacuation plan to achieve this; other institutions use postings on the back of doors (similar to what one would see in a hotel) to comply with this element of the code. When training college students, it is important to think outside of the box. Lecturing students will do little more than put them to sleep. Developing programs that engage resident students is not only appropriate, but it is essential to ensuring their understanding of the fire code. Such programs can be conducted with little cost to the fire prevention department, through the establishment of partnerships, the importance of which will be discussed in a subsequent section. Programs include the Community (Resident) Assistant Fire Academy, poster contests in keeping with the NFPA’s annual fire prevention message, fire prevention trivia contests, and community outreach programs. It is essential that fire prevention specialists get involved in their community. Managers need to allow the fire prevention specialists to adjust their hours to allow various kinds of training, at various times of the day. Few college students are accustomed to the nine-to-five schedule of campus employees. While full-time employees may be accustomed to attending training starting at eight in the morning, college students are rarely willing to attend programs at that time. Dealing with the realities of college life is essential. Students are going to have parties, drink, and make poor decisions. Guiding them to act safely and acknowledge the realities of college life is an important part of giving them the training they need. Just as working with your staff members in large departments can be difficult, training each resident student within 24 hours of their move-in can be an insurmountable task for the fire prevention specialist. In these cases, it is advisable to use the community (or resident) assistants to provide fire prevention training to students during their initial floor meeting. By developing a curriculum that offers our community assistants “train-the-trainer” sessions, the burden of training large numbers of students single-handedly can be alleviated. As with all trainings, maintaining a record of the initial “train-the-trainer” session as well as subsequent trainings is essential. Another way to overcome the difficulty of training large numbers of students is making fire safety training a required step for the residents prior to moving into their new rooms. One can use room condition reports, in which the students sign that their room is in acceptable order prior to moving in. At the bottom of these reports, one can place a section specifying that the resident has read and acknowledged your campus’s fire evacuation plan and that he or she knows where its staging areas and evacuation routes are located. This information can be made accessible online or displayed on large poster board paper in the area where students sign in. Forms can be produced and printed on four-part NCR (no carbon required) paper, allowing the resident, the residence hall office, the campus’s office of residence life, and the department of fire safety to retain copies. Copies are forwarded to the department of fire safety after all residents have moved in or if room changes occur. This system has two benefits: First, it alleviates the fire prevention official from needing to train all residents individually. Second, it ensures that all residents, including those who transfer their rooms later in the semester, receive and acknowledge this training. The drawback of this system is the large amount of paper that needs to be managed. Off-campus students. A population often overlooked by campus-based fire prevention specialists is off-campus students. This includes both commuter students and, when housing is not provided by a college or university, Greek Life students (e.g., fraternities or sororities). Efforts need to be made to ensure their safety as well, as they are also members of your respective campus communities. Programs can be developed to achieve inspection and training initiatives in these areas. For instance, a fire prevention department can offer complimentary, nonbinding inspections of fraternity houses, offering suggestions to make these occupancies safer. It would be wise to check with your college’s or university’s legal department to draw-up an advisory based waiver, where inspectors can check these houses, as well as the presence and functionality of smoke alarms and fire extinguishers, without opening the college or university up to liability. Other programs can be developed to allow for outreach to these off campus community members. The Resident Assistant Fire Academy can be altered to confront the realities of off-campus living. This is especially important given the realities related to Greek housing. Crowd control managers. Training requirements are constantly changing, with ever more requirements being added annually. One such example is training for crowd control managers (CCMs), who need to be onsite during large scale events. These events include concerts, sports games, graduation ceremonies, and other events that may draw large crowds. This requirement is intended to put the responsibility on the respective college or university, requiring them to have trained personnel at each event. The training leads to specialized licensure. The first step to gaining this licensure is training your employees to thoroughly understand emergency personnel requirements when dealing with a large scale event. Most of the training is to familiarize CCMs with emergency procedures such as evacuation. There is a venue-specific element to the training to ensure that crowd control managers are capable of performing an evacuation of the specific venue. If you followed the link for the Station Nightclub fire video listed in the Partnerships section, you can see just how masses react in emergencies. Some reports of this fire state that one of the bouncers prohibited patrons from leaving through an emergency exit door because he was told that no one was to go through the door. The purpose of CCMs is to control this mob mentality while knowing what emergency exits are supposed to be used. Further information on CCMs can be found at the Maryland State Fire Marshal’s Website. Their online training can give you a good idea of what this training covers and of specific items that can be adopted into your training. Although this training is not required in all jurisdictions, it is not a bad idea to add elements of it or to adopt a full curriculum for individuals who are tasked with organizing large-scale events. Potential targets for this training include theater ushers, athletic staff, or others that may be working for your college or university during large scale events. It may be better to offer more training than is necessary than to offer too little training. The intent of this model is to provide a safe experience for campus community members and visitors, not to replace the fire prevention staff. Do not fear giving your constituents too much information—empower them to be safe! In order to administer a hot work program, IFC 2601 et Seq. requires that the administrator be an approved, facility-designated representative who is trained, onsite, and responsible to ensure that hot work is being performed safely with measures in place to prevent fire and its spread. The campus fire prevention official can be designated as the hot work program administrator if your college or university opts to house the hot work permitting process under a single entity. Training consists of understanding means for protecting combustibles from exposure to fire, including the removal or covering of combustibles, the covering of openings, general housekeeping, conveyor shutdowns, the covering of partitions and floors, other general precautions when performing hot work, and the location and use of fire protection and detection systems (including how to avoid accidental activation of the building fire alarm system). The administrators also need to be trained in fire watch procedures, including when and where they are required, what the role of fire watch personnel is, and how to select and use fire extinguishers and/or hose streams. As with other forms of training, this can consist of face-to-face sessions for small groups or train-the-trainer sessions for large groups. Online training systems are also available through insurance companies. FM Global offers free online training in areas such as managing a hot work permit program. They also offer prepackaged hot work permit systems, which are free. Both the training and permits can be used to help establish a hot work training system for your campus. You will still need to conduct training specific to your site and operations, including the use of fire extinguishers, but these free products offer an excellent starting point. Finally, as part of training the fire code requires that fire drills be conducted at various intervals depending on the use group or occupancy of a building (see Table 6). As with any training, fire drills require records. 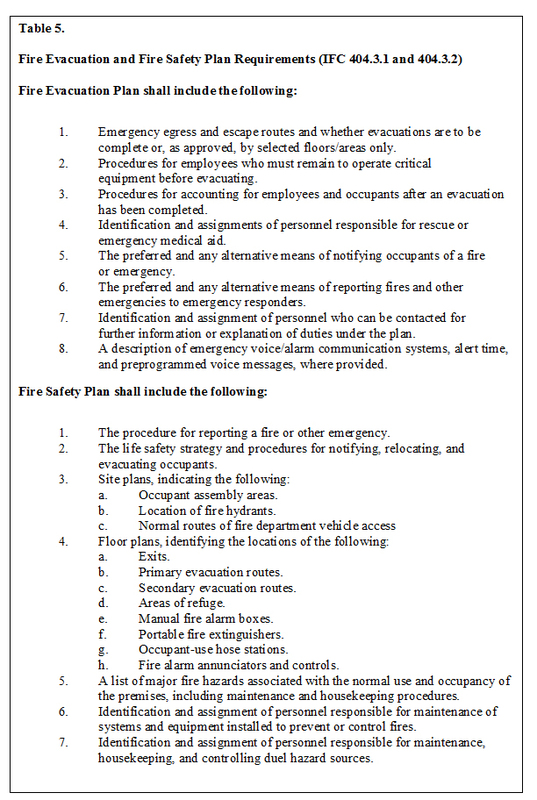 Table 7 lists the numerous requirements that must accompany each fire drill record. Specific actions taken by employees are governed by federal and state laws. Check with your jurisdiction to determine what applicable laws affect the actions of your employees. In most states, individuals who are tasked with firefighting duties require additional, specific training and adequate firefighting and personal protective equipment. This section assumes that the members of your campus community are neither trained nor equipped to fight a fire. Facilities staff in the event of a fire. The responsibility of facilities staff during a fire is to exit the building. While they are exiting the building, they should try to guide other campus community members to the nearest exit. Thus, it is important to train them in the exit and evacuation routes for their work areas. If these staff members are expected to use a fire extinguisher, they need to be adequately trained in the use and limitations of fire extinguishers. If a fire is noted but no alarm is sounding, the staff member should activate the building’s fire alarm system by means of a manual pull station while exiting the building. Once the staff member leaves the building, he or she should report to a designated staging area. Any information pertinent to the incident (e.g., size or location of a fire, community members who refused to leave, etc.) should be reported to arriving emergency responders or by a telephone call to your campus’s emergency dispatch center, depending on your campus’s policy. These procedures can be covered as part of the required annual training. Facilities management in the event of a fire. Facilities managers are responsible for ensuring that all of their employees are accounted for in the event of a fire. This is done through maintaining accountability and knowing where one’s employees are supposed to be working at any given time. The manager can contact the employee by means of a cell phone or in person. Any missing persons should be reported to arriving emergency personnel or by means of a telephone call to your campus’s emergency dispatch center, depending on your campus’s policy. To this end, facilities managers should be trained on the same staging locations and exit procedures as their staff. These procedures can also be covered as part of the required annual training. As discussed earlier, forming partnerships is an essential element of a successful program. There are many reasons for this. First, campus community members should see your department as being there to help them rather than simply to harass them. This theme is related to the community policing movement that developed in the late 20th century in urban areas, where police were not seen as beneficial to the community due to perceived heavy enforcement. Furthermore, establishing a community environment is easier when your fire departments respond to your campus. The fire department should be a member of your community and should be invited to take part in celebrations (e.g., homecoming). Making the department staff feel like a part of your community makes them want to come to your campus rather than simply respond to another culinary mishap. To this end, it is important that your fire department knows that they are allowed to and encouraged to interact with the campus community. Unattended cooking calls offer an excellent opportunity for your fire department to use capitalize on a “teachable moment.” The truth is that, as a campus fire prevention official, you are unlikely to be present outside of business hours, when many of these calls take place. It is essential that you use your fire department as an extension of your office, encouraging them to have positive, meaningful interactions with your students. It is important to mention here, that it is appropriate to correct the behavior your fire department (respectfully, of course) when they leave students outside in the cold or in the middle of the night for setting off a fire alarm and disturbing the firefighters’ slumber. This does not give the students an appropriate message. The students who evacuated did the right thing by leaving the building; punishing these students tells them that, if they evacuate, they will need to stand outside for prolonged periods of time. Thus, they are less likely to evacuate upon subsequent alarms. Fire departments should be encouraged to provide positive interactions with your students, but discouraged from punishing them. Partnerships should be formed at every level of your campus between internal and external stakeholders. As you have seen, forming partnerships allows the reach of a small, campus-based fire prevention department to extend throughout the campus. One area in particular where partnerships can help your work is in ensuring that a single fire-safety message is branded by all of your stakeholders. When these messages are mixed, confusion can set in. An added benefit of forming partnerships is eliminating conflicting messages. This works with violations to the fire code, additional restrictions that your facility may require, and the conditioning that students have to act in a certain way. In his famous experiment, Ivan Pavlov conditioned his dog to salivate when he rang a bell. He did this by ringing the bell and then offering his dog food. The response that Pavlov got from his dog is known as classical conditioning. When fire alarms sound, students are conditioned to leave a building. But they also are prone to leaving through the same doors by which they entered, a tendency that has caused many deaths (see the Station Nightclub fire footage for a very graphic example). 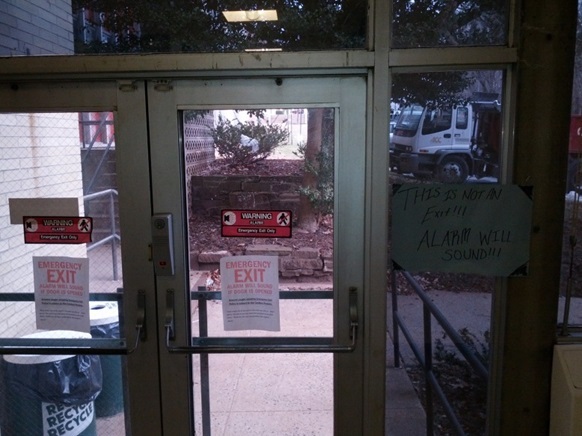 When campuses prevent or discourage their students from using all available exits at all times, they are conditioned not to use those exits. Many schools have concerns about the security of their buildings and many use systems (e.g., Detex panic hardware with audible alarms) to prevent building occupants from using doors that may pose a security threat. 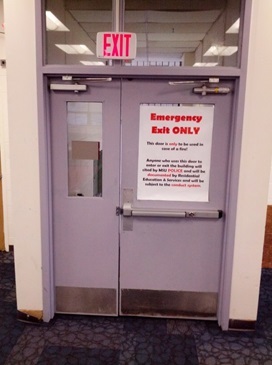 Images 1 and 2 illustrate the lengths that some schools will go to in order to prevent exit doors from being used. While security is certainly an issue, campus-based fire prevention officials need to work with their security/police, residence life (or similar group), and other campus stakeholders to prevent mixed messages. Fire prevention officials generally want students to use fire exits, but other campus partners may be concerned with unauthorized access or students brining alcohol into a dorm building through these doors. Image 1. This door has alarmed panic hardware. Joseph Zobel, Montclair State University Department of Fire Safety, 2013. Despite what the sign so eloquently states, this is in fact an exit. Note also the storage obstructing the exit and the alarm located in the middle of the doors. Regardless of the code you are trying to enforce, forming partnerships and preventing mixed messages will be essential to your efforts. Moreover, learning who does what on your campus is essential to this effort. For example, some colleges and universities and some jurisdictional fire codes prohibit smoking within a set distance from doorways. To make this prohibition effective, think outside of the box: Where do people smoke? 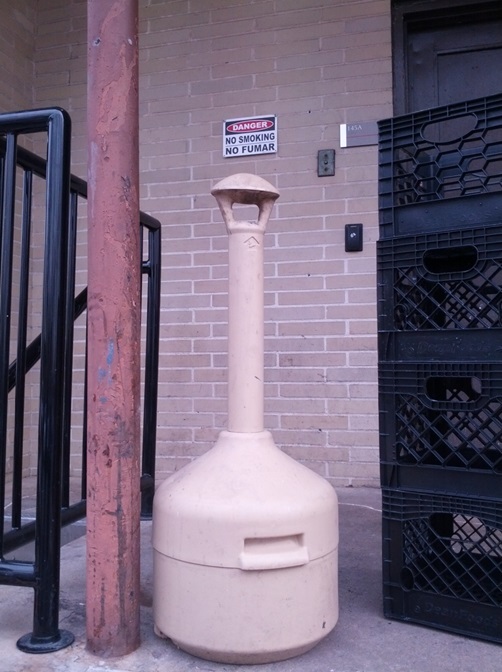 Usually where cigarette receptacles are located. Who cleans these receptacles? At some colleges it is the housekeeping staff, while at others it is the grounds department. You will need to work with the department tasked with cleaning your cigarette receptacles to ensure they are located in an area where smoking is permitted. Image 3 shows how a mixed message can cause problems with enforcing these codes. Ceasing the use of mixed messages can be accomplished through training. Image 3. The mixed message here is that there is a no-smoking area with a cigarette receptacle directly across from it. Where do you think individuals are likely to smoke? These on-campus partners may be willing to help cover some of the expenses that such programs can incur. If budgets are tight at your school, as many can appreciate in today’s economy, off-campus partners can help pay for many of your programs. The Federal Emergency Management Agency provides Fire Prevention & Safety Grants to fire departments, fire prevention agencies, and others to develop fire prevention programs and initiatives. Further, insurance providers such as FM Global provide grant opportunities that can help pay for fire prevention programs. It is important for campus fire prevention administrators to think outside of the box for funding. In most cases, there is no harm in asking for help to cover your expenses. Regardless of the type of enforcement powers afforded to the campus fire prevention agency, certain life hazards require extra attention and must be inspected by each respective campus’s AHJ, regardless of who the AHJ is. Table 8 lists an example from the New Jersey administrative code. It is important to note that each state’s laws are different. Because of this, Table 8 is only applicable to New Jersey and likely looks like gibberish to anyone outside the state. Because most states have adopted their own inspection cycle for each occupancy group (life hazard use), an easy way to find out what your inspection cycle will be is to check with your AHJ or refer to your state’s administrative code if you are the AHJ. State administrative codes can be found at websites such as Lexis-Nexus. A list of administrative codes for each state can also be found at the National Association of Secretaries of State website. Although these are great references that allow you to access information for free, they are limited by the lag time between the acceptance of new laws and their posting on these sites. Other information can be found directly through each State’s fire safety/prevention department (e.g., state division of fire safety, state fire marshal’s office, etc.). There are a number of different fire code violations that can be found in each building, but some are unique to college campuses. For example, candles are prohibited in R-2 use groups (e.g., dormitories). Also, inspections need to check both the interior and exterior of a building. 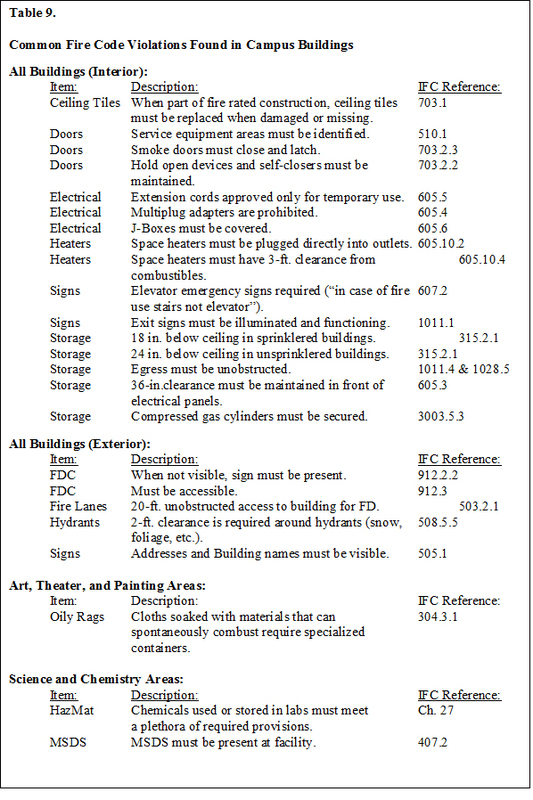 Please refer to Table 9 for a list of common fire code violations found on college campuses (Please note that this list is not exhaustive and is intended to illustrate violations that are commonly found on the campus of Montclair State University). Many of the violations are common-sense, while others require specialized knowledge. Attending and completing a fire inspector course available through most regional fire training centers is an important step toward understanding the code requirements for your buildings. Without adequate training, those who are tasked with fire prevention duties will be ineffective. It is equally important to understand the intent behind the code passages. Publications are available that give the history of code references and can help a fire prevention professional understand why a code was written. An example is the International Code Council’s (ICC’s) International Fire Code Commentary. The ICC also publishes the International Fire Code. Campus fire prevention offices should strive to conduct monthly inspections in all campus buildings. Having adequate staffing to achieve this goal is important. The rationale behind this is simple: Maintaining a consistent presence in your buildings leads to a higher awareness of fire prevention in your campus communities. With a regular inspection of campus buildings, dangerous situations can be abated at once rather than being neglected for months. All rooms, offices, and common areas should be checked as part of these monthly inspections. Often it is an institution’s employees who are at fault for violations because they do not fully understand the fire code and its implications. For this reason, it is important for campuses to use trained and licensed fire inspectors. Rather than penalizing employees for infractions, properly trained fire prevention staff should use these occasions as another teachable moment—educating the campus community in an informal manner, allowing other employees to understand the reason for a violation, and limiting the chances of a reoccurrence. Another situation when trained and licensed inspectors are critical is during resident room inspections. Although some students accept a request to abate a violation without reservation, others do their best to circumvent policies. In the latter case, educating the student is equally as important as educating an employee. Using teachable moments to educate community members will lead to a greater understanding of the fire code. Conversely, simply telling a student (or employee) that he or she cannot use prohibited item (e.g., extension cords) because “the code says so” will lead to greater resistance as compared to explaining why certain items cannot be used. Most campus community members will listen to reason. Resident room inspections can be conducted in the fall and spring semester, with follow-up inspections occurring at intervals as established by your jurisdiction’s fire code (usually 15 to 30 days). Because compliance cannot always be achieved through teachable moments and traditional means, developing a cohesive relationship with campus partners is crucial to gaining compliance. This will be discussed in depth in the next section. The amount of paperwork required to report fire code violations and obtaining abatements can be cumbersome for a larger campus, so administrative support may be required to handle it. Though smaller campuses may be able to task a departmental secretary with these duties, larger campuses may find that having one individual designated to handle administrative matters allows for a centralized approach. Those in administrative roles need to know what agreements are in place between departments and to have the latitude to suggest alterations if the existing ones do not work. Violations pertinent to the maintenance department. Regardless of whether a campus-based fire prevention agency uses an outside entity as their AHJ or if they are their own AHJ, establishing relationships is important, as it will allow the campus fire prevention official to do his/her job more effectively. Having a working relationship with your maintenance department is important. Whether you handle violations through a work-order system or merely issue handwritten violations that others make into work orders, it is your maintenance department that will end up responding to most of them. Knowing which trade to contact and who their supervisor is will help expedite the processing of these violations. Agreements between the campus fire prevention department and campus maintenance department must be set to ensure that a violation issued by a campus entity or an AHJ will be handled in the same manner. Thus, it is essential that the end worker fixing these violations is held equally accountable for the work, whether it was issued in house or by your AHJ. Nevertheless, not all violations will fall under the campus’s maintenance department’s purview. Violations pertinent to faculty/staff. When violations are found in areas that can be attributed to the actions of your faculty/staff, having a working relationship with the deans or administrators of these areas can assist in abating these violations. Flexibility here is key—if the institution’s research depends on a given situation, it will take more work to gain compliance. For example, if a freezer being run off of an extension cord is holding laboratory specimens at a set temperature, it could be disastrous to ongoing research to unplug the extension cord. In cases such as these, it is up to the fire prevention official to ensure compliance (e.g., coordinating with the electrical shop to have a new outlet installed), while also protecting the institution’s research goals. Facilities managers’ role. There are several ways facilities managers can aid the campus fire prevention department in ensuring fire code compliance. If a potential violation is noted, it can be brought to the attention of the fire prevention agency. Alternatively, a work order can be submitted directly by the facilities manager. But the manner in which fire code violation work orders are addressed depends on existing agreements. If the campus fire prevention department is tasked with overseeing all fire code violations, it may make more sense to coordinate the abatement of a violation through the fire prevention department. Another way facilities managers can help prevent violations is by scrutinizing work order requests and asking the fire prevention agency for their input. Work orders may be overseen by a trades supervisor. These supervisors often have a better understanding of various code requirements. For instance, an electrical supervisor is likely to know where certain electrical components can be installed; a carpentry supervisor is likely to know if a door is a smoke door and what devices can be installed on them. This requires facilities managers to work with the fire prevention agency to ensure compliance throughout a campus. The Family Education Rights and Privacy Act (FERPA) is intended to protect students with regard to their educational records. Although some institutions may classify some of your records as exempt from this act, others may not. It is fairly common for campus fire prevention offices to field telephone calls from students’ parents or guardians with regard to fire code violations in resident rooms, so it is important to remember what information you can and cannot disclose. To determine which information is classified, it is highly recommend that you contact your institution’s legal affairs department. 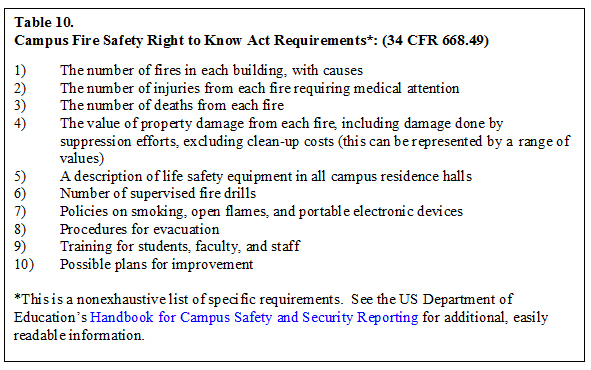 The Campus Fire Safety Right to Know Act is intended to inform students and parents of fire safety procedures and other information at your college. It allows for informed decision making by students and parents when choosing among higher education institutions. The Act requires that information on fire statistics and fire safety policies be publicly displayed and easily accessible, and is similar to the Clery Act, which requires campus security and safety information to be publicly available. Table 10 lists the requirements of the Campus Fire Safety Right to Know Act. Although the table is a useful starting point, it is important to read the law it is based on (34 CFR 668.49) or the Department of Education’s Handbook for Campus Safety and Security Reporting, which offers excellent information in a narrative format and is an alternative to reading and deciphering legislation. It is common for the campus fire prevention agency to work with their campus police/security/public safety department to compile the Campus Fire Safety Right to Know information in conjunction with the University’s annual Clery Act release. October 1 is the deadline for reporting the previous year’s information. If you track and maintain your fire statistics regularly, this requirement will be far less cumbersome. It may help to update your database monthly, which will allow you to complete this requirement in a very short time. Forming coalitions is important. Work with other schools in your state to develop a set of best practices to meet the needs of your specific school. Join professional organizations such as the Center for Campus Fire Safety, which will give you access to existing training, best practices, and other professionals with whom you can establish a professional network. Unique to our profession—especially at academic institutions—is the idea of “R&D” or “rip off and duplicate.” If another college or university has a program that might be of use to you, ask them for information on it. Procuring the funds for such programs can be difficult for most fire prevention departments, as their budgets can be fairly limited. Partnering with on-campus and off-campus stakeholders is essential to funding programs. Although it may be time-consuming, applying for available grants can result in a ready source of income. Although your budget may be limited, not all departments and agencies have such stringent restrictions. These funds can be used toward training programs, many of which are required by the IFC. There are many alternatives to traditional lectures that can prove to have a better impact on students—these of course cost money. But not all training sessions are formal and required. Using teachable moments while conducting inspections allows a fire inspector to educate while enforcing the fire code. These teachable moments allow for a greater understanding of the fire code, while limiting the chance of a reoccurring violation, however these teachable moments require specialized knowledge of the fire code. In order to fully appreciate and understand the fire code, inspectors should undergo formal training and gain certification as fire inspectors. Depending on the size of your campus, your department may require additional personnel. For this to occur, the levels of management above the fire prevention specialist need to place stock in the fire prevention department, allowing for adequate staffing and consolidating responsibilities into a single person (head of the department) to avoid complacency. While a campus fire prevention department works to ensure a safe workplace for their fellow employees, it is equally important to consider the students at their institution. It is important to remember that, for the first time in their lives, for most of our students, they are living on their own. Their parents are not there to guide them and keep them safe. The employees of campus fire prevention department need to be the ambassadors to a safe lifestyle. This requires patience and the careful planning of activities. Fire prevention agencies at four year colleges and universities traditionally have a difficult time in dealing with the attrition rate of students. Most students stay on these campuses for a period of four years. While some may take longer to graduate or others may continue with graduate school, the vast majority of your students are only with an institution for four years. As resident students may spend the majority of their time on your campus, it is important that you condition them to take fire safety seriously. To achieve this, campus fire prevention departments must constantly work with their student body. Campus fire prevention departments must consistently enforce fire code, while taking the opportunity to explain why a violation is against fire code. Campus fire prevention department must train their students and faculty/staff and retrain them, regularly conducting drills, to ensure that campus community members retain a fire safe lifestyle. Abate: To correct a problem that is causing a violation; to bring something that is not compliant into compliance. AHJ: Authority having jurisdiction—the individual or entity that has the ability to enforce fire codes through state or local authority. Group A: Assembly use areas, e.g., auditoriums, cafeterias, multipurpose rooms, etc. Group B: Business use areas, e.g., offices, (college) classrooms, etc. Group E: Educational use areas, e.g., primary and secondary schools. Group I: Institutional settings staffed 24/7, housing individuals who are by age, health, mental disability, or incarceration unable to leave on their own. Group R-1: Transient residential occupancies, including hotels, motels, and boarding houses (with transient guests). extended stay hotels/motels, monasteries, and vacation timeshare properties. Buildings: Buildings that are greater than 75 ft. tall from the lowest floor of fire department access. IFC: (International Fire Code) Fire codes developed by the International Code Council. Lock-In: Group overnight stays in buildings not traditionally intended to hold overnight guests. Fisher, R. G. (2008). After the Fire: A True Story of Friendship and Survival. Hachette Digital, Inc.
Jones, R. T., Kazdin, A. E., & Haney, J. I. (1981). “Social validation and training of emergency fire safety skills for potential injury prevention and lifesaving.” Journal of Applied Behavior Analysis, 14(3), 249–260.